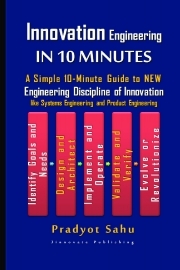 Description of "Innovation Engineering IN 10 MINUTES"
Innovation Engineering IN 10 MINUTES is a Simple 10-Minute Guide to NEW Engineering Discipline of Innovation like Systems Engineering and Product Engineering. Innovation Engineering is a new engineering discipline as described in the book “Pradyot Sahu – An Introduction to Innovation Engineering”. Unlike other engineering disciplines which focus on the other things such as Systems Engineering for Systems, Product Engineering for products, Software Engineering for software, Innovation Engineering focuses on Innovation and how to maximize or optimize Innovation and its Strategic Benefits and Economic Benefits or Profits and Impacts. As written in the book cover also, this book is a simple 10-minute guide to the new engineering discipline of Innovation. As described in the Contents, you will find, what is Innovation engineering, why Innovation Engineering, Innovation Engineering processes and the details of each processes to be finished within 10 minutes in total to get an overview of each. At the end of understanding of each chapter, you will be able to review the book in 10 minutes for sure. Pradyot Sahu is an Innovator, Author, Researcher and Speaker on Innovation, Management and Technology. He is a Senior Member of IEEE. Pradyot Sahu reviewed papers on Innovation, Management and Technology in various IEEE International Conferences including IEEE International Technology Management Conferences, ITMC-2012 held in Dallas, TX and ITMC-2011 held in San Jose, CA; IEEE International Engineering Management Conferences, IEMC China-2008 held in Beijing, China, IEMC-2006 held in Brazil, IEMC-2005 held in Canada. He was also a Technical Program Committee Member and Paper Reviewer of IEEE International Conferences on Management of Innovation and Technology, ICMIT-2012 held in Sanur Bali, Indonesia, ICMIT-2010 held in Singapore and ICMIT-2008 held in Bangkok, Thailand. His research interests include Innovation, Innovation Engineering, Innovation Practices, Innovation Infrastructure, Innovation Modeling including applications in Business Innovation,Service Innovation, Product Innovation, Technology Innovation, Engineering Innovation, Social Innovation and more. Reviews of "Innovation Engineering IN 10 MINUTES"